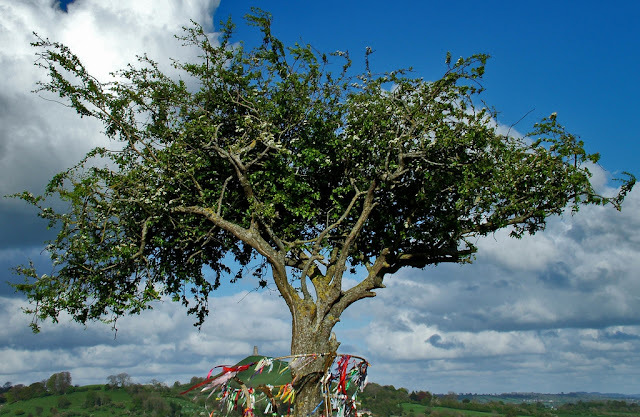 This tree, the Glastonbury Thorn, continued to grow and to flourish throughout the centuries. 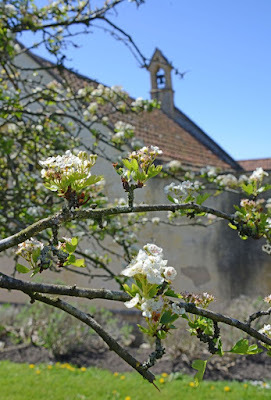 It became a marvel to all by blossoming twice a year, not only in the spring around the time of Pascha, but also in the dead of winter, around the time of Christ's Nativity. Thus it became a twofold symbol. In the spring it was a type of the Resurrection, of life overcoming death, symbolized by the blossoms of spring. In the winter its blossoms recalled the Birth into the world of Life Itself, the Birth of the God-Man in the midst of death, the spiritual winter of sinful man. 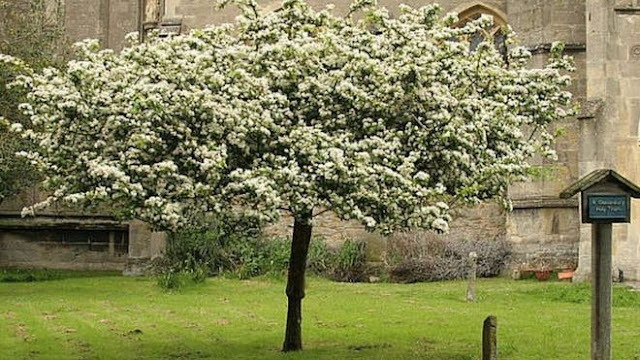 Over the centuries, the tree's fortunes - its flourishing and its periodic destruction - would symbolize the rise and fall of the Church in Britain. With the tree, St. Joseph also planted the first church, which became a monastery. 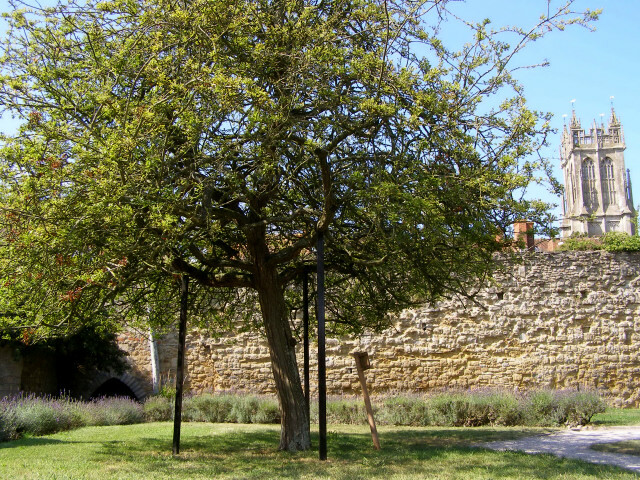 The holy tree attracted pilgrims throughout the centuries, and the monastery grew to be one of the greatest in Britain, second only to Winchester, which was the original episcopal seat of the British Church. 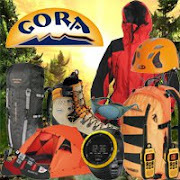 Glastonbury remained a key spiritual center during the period of the English Church, as it had in the British Church: We have historical evidence that the monastery was thriving in the seventh century. Sadly, the 1066 invasion of William the Conqueror, with its imposition of papism by the Normans, ended the Orthodox period of the Old English Church. 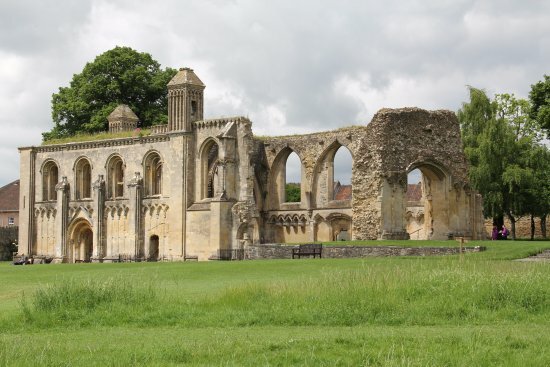 Nevertheless, Glastonbury Abbey and its precious treasure the holy Thorn Tree remained a place of pilgrimage and veneration. By the 14th century, it had grown to be one of the largest and most powerful monasteries in England. In the sixteenth century, however, its glory was despoiled during the destruction of the monasteries by Thomas Cromwell's henchmen under the unhappy Henry VIII. Glastobury's last abbot was hanged, drawn, and quartered, the brotherhood was disbanded, and all the abbey's wealth was "Swept into the laps of parasites and whores," i.e., the founders of the ruling class of modern England, as T.S. Eliot aptly describes it in Murder in the Cathedral. 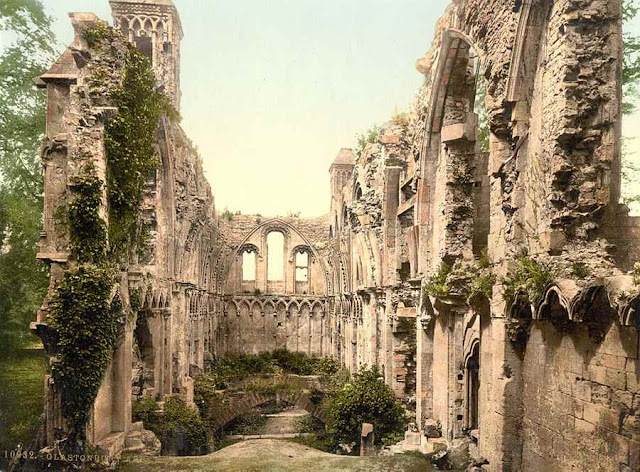 The lackeys of the apostate king destroyed the abbey, and without its spiritual center and higher purpose, Glastonbury became a backwater. The holy Thorn Tree, however, though orphaned of its monastic guardians, continued year after year to perform its sweet miracle of blossoming in "bleak mid-winter," as though in reproach to the pride and rationalism of the dawning secular age. "Well, this is a miracle, isn't it?" said the king. "Yes, Your Majesty," someone replied, "a miracle peculiar to England and regarded with much veneration by the Roman Catholics." "How?" said the king, "when this miracle opposes itself to the Roman pope? 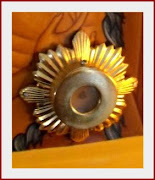 You bring me this miraculous blossom on Christmas Day, Old Style. Does it always observe the Old Style, by which we English celebrate the Nativity, at the time of its flowering?" "Then the pope and your miracle differ not a little, for he always celebrates Christmas Day ten days earlier by the calendar of the New Style..."
Tragically and significantly, King Charles I and the Glastonbury Thorn shared the same fate during the English Civil War (1642-1651), when a more sectarian, iconoclastic, and fanatic spirit possessed a large portion of the already Protestant nation. The Puritan rebel leadership staged a show trial and beheaded their king, and partisans of the possessed regicides cut down and burned the holy Thorn. The local faithful, however, preserved the roots of the Thorn, which they separated and planted in several different locations, where they grew into trees that continued to bloom on "Old Christmas." In 1752, the British government decided to accept the papist calendar in order to be in sync with Western Europe. The new regime that had engineered the "Glorious Revolution" of 1688, which destroyed the power of the monarchy and effectively made a greedy oligarchy of merchants and usurers the true rulers of the English nation and her global empire, had no use for pious customs if they impeded lucrative trade and geopolitical ambition, and the calendar was one of these. The people did not easily accept the change, however, and there were riots in various places. Even in faraway British America, isolated communities such as the "hillbillies" of Appalachia continued to keep "Old Christmas." 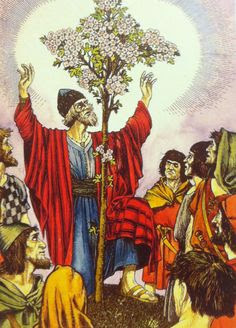 And every year, on the true Christmas, crowds continued to gather around the Glastonbury Thorn to see what it would do, and the miraculous blooms continued to appear. Time passed, the Thorn continued to be propagated in Glastonbury, and its descendants continued to bloom twice in the year, on or close to the days of Our Lord's Birth and Resurrection. In 1951, townsmen planted one of these trees at the original site on Wearyall Hill. It made for a beautiful site seen from all over the town, and again became a center of pilgrimage. But this brief return of normality after World War II marked the last generation of a recognizably Christian England, and a new period, darker than any preceding, was about to begin. 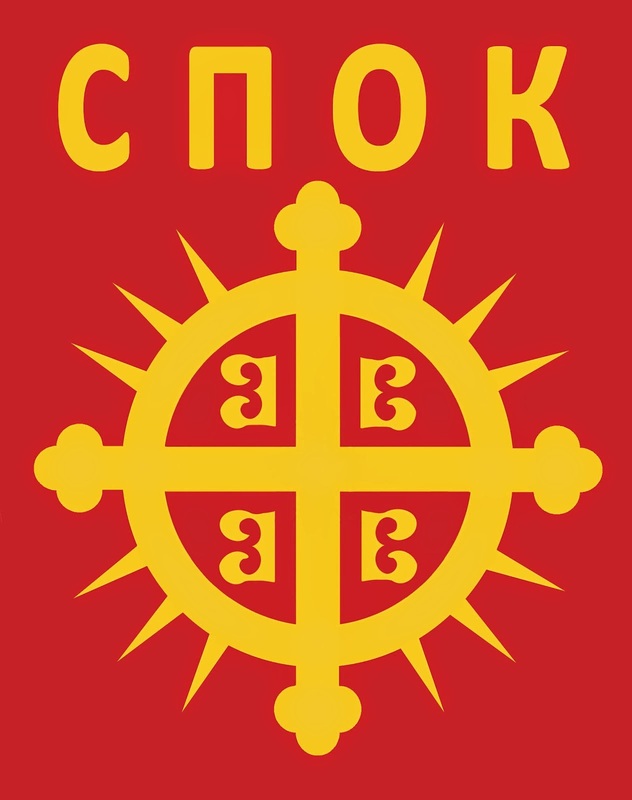 The cultural revolution of the 1960's with its concomitant final, utter apostasy of the Church of England into the madness of postmodern unbelief and immorality, set loose an aggressive anti-Christian spirit in the land. Demonized partisans of this anti-Christianity - public secularists and private, or not-so-private, occultists as well - began a career of destroying what was left of the old culture in a campaign worthy of their Puritan antecedents. These were soon to be joined by fellow demoniacs, the Mohammedan invaders, who were welcomed and coddled by an apostate government in service of the Satanic global elite which is using the possessed Saracens to destroy the native English people. It is only natural that this evil spirit would reach even unto Glastonbury, for the holiest places always attract the worst demonic activity. Glastonbury has become a favorite haunt of witch covens, neo-Druids, and all kinds of practitioners of the demonic arts. 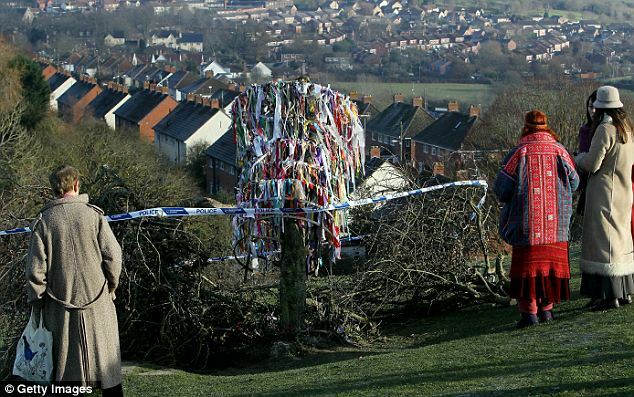 In 2010, someone viciously cut off the crown of the holy tree on Wearyall Hill, and he or his fellows later came back to destroy even the shoots that continued to appear. It was clear to one and all that this was a public attack on the Christian faith. Finally the town removed the tree entirely. Another tree was planted on Wearyall Hill in 2012, but this one died also at the hands of evil vandals. There was also a descendant tree of the Holy Thorn at the ruins of the abbey, but this was pronounced dead in 1991. To this day, however, at yet a third location, the Church of St. John, a few trees of the holy Thorn lineage can be found, and they still faithfully repeat their two annual acts of homage to the King of Life. The present Queen still receives a blossoming branch at "Old Christmas," which is cut with special ceremony. 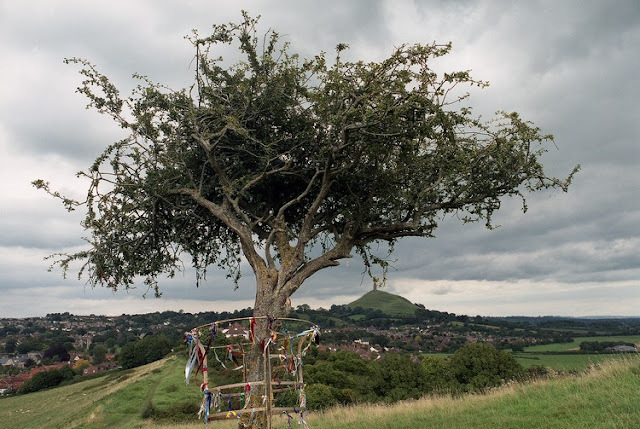 Thus for two millennia, the Glastonbury Thorn, planted by the same hands that took the Lord from the Cross and laid Him in the Tomb, has witnessed the planting, blossoming, decline, and near-death of the Christian faith in Britain. Despite every attempt to destroy them, both this tree and this faith continue to live, albeit in quietness and obscurity. 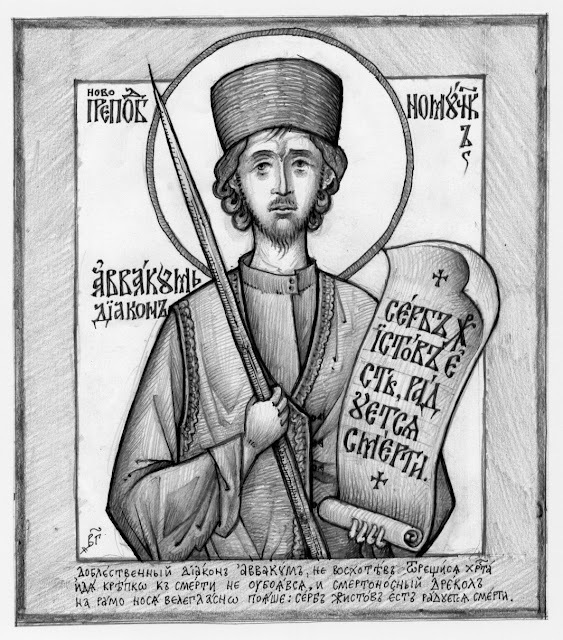 By the inscrutable wisdom of God, the true Faith, Orthodoxy itself, has returned to Britain, whose truth has been witnessed to silently, through all of these centuries, by the holy Tree that blossoms according to the true calendar. Though few in number, the True Orthodox on this isle, a blessed and beautiful land converted by St. Joseph and sanctified by innumerable saints, must continue to bear witness as well. 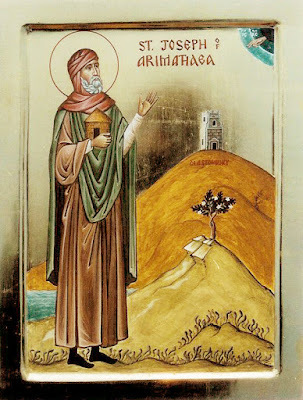 Like the silent, hidden roots of the Holy Thorn, so too the silent, hidden relics of the saints, the blood of martyrs and tears of the ascetics that soak the soil of this blessed isle, the innumerable holy wells, the mossy wayside crosses - all of these too bear witness. Like the silent, hidden roots of the Holy Thorn, the True Orthodox remnant on this isle may one day bear beautiful fruit, if only they too will bear witness, if only they too will remain faithful, faithful as the merry little tree planted by St. Joseph on that Christmas Day long ago.